is the son of Mary Merrill and the late Judge Horace Merrill of Heflin, Ala., in Cleburne County. He was born on November 12, 1963, in Wedowee, Ala., in Randolph County. He grew up in Heflin and is an Eagle Scout from Heflin Troop 206. He is a graduate of Cleburne County High School and The University of Alabama, where he served as President of the Student Government Association in 1986-1987. While attending The University, John served as a Congressional Intern for Congressman Bill Nichols in 1983 and Sen. Howell Heflin in 1984. After college, John worked as a governmental affairs intern at the Chamber of Commerce of West Alabama in 1987-88; National Advertising Account Executive and Manager for Randall (now Randall-Reilly) Publishing Company from 1988-90; Assistant Director for the Tuscaloosa County Industrial Development Authority from 1990-93 where he assisted in the recruitment of Mercedes-Benz; Director of Business Development for the Chamber of Commerce of West Alabama in 1993-94; Director of Community Relations and Community Education for the Tuscaloosa County Board of Education from 1994-2010; and served as Business Development Officer for 1st Federal Bank in Tuscaloosa from 2011-2015. On Nov. 2, 2010, John was elected to represent the people of District 62 in the State House of Representatives with 87 percent of the vote, which was the highest percentage garnered by a candidate in any contested House race that year. He served as the Secretary/Treasurer of the House Republican Caucus and was a member of the powerful Rules Committee, Economic Development and Tourism, and Constitution, Campaigns, and Elections Committees. In 2011, he was presented the "Axe Award" by the Alabama Association of Volunteer Fire Departments and became the only freshman ever to be recognized as their Legislator of the Year. John was a member of the inaugural class of NCSL Early Learning Fellows in 2011, one of 30 Legislators selected nationwide and the only one from Alabama. In 2012, he was named the Alabama House Legislator of the Year by the Children’s Trust Fund, he was recognized by the Alabama Republican Party as a Rising Republican Star, and he was presented with the Tuscaloosa All-Star Award for Excellence in Caring for Veterans. In 2013, he was selected as the Soil and Water Conservation District Area III Outstanding Elected Official, Outstanding Legislator by the Alabama Association of Rescue Squads, and he was named as the Child Advocate of the Year at the Early Intervention and Preschool Conference. In 2014, John was awarded the Silver Beaver by the Black Warrior Council of the Boy Scouts of America for outstanding volunteer service in Scouting. John was identified by the Sunlight Foundation as the Most Effective Republican Member of the Alabama House of Representatives from 2011-14, and he was named Legislator of the Year by the Tuscaloosa County Young Republicans in 2014. In 2015, he was selected as one of 48 leaders from around the nation to attend and graduate from the Council of State Government’s prestigious Henry Toll Fellowship Leadership Program. On Nov. 4, 2014, John was elected as Alabama's Secretary of State with 65 percent of the vote, winning in 53 of Alabama's 67 counties. 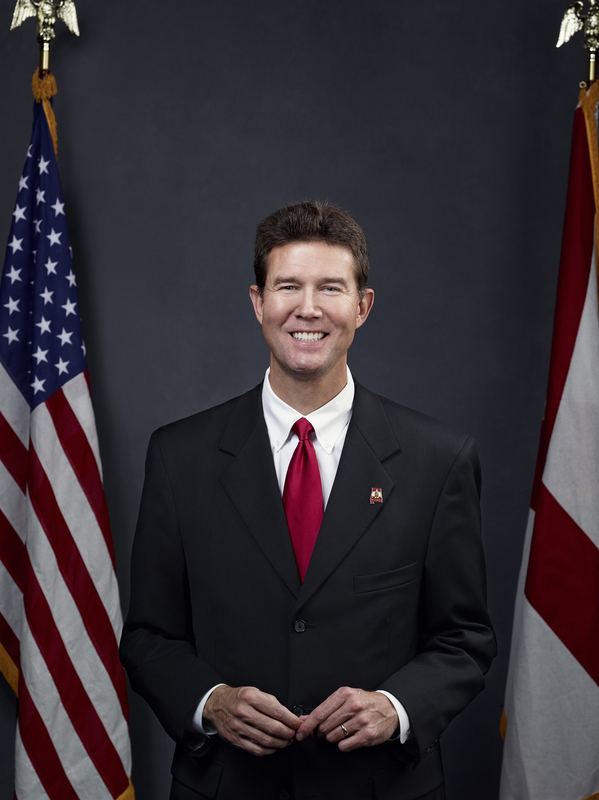 He was inaugurated as Alabama’s 53rd Secretary of State on Jan. 19, 2015. John is very active in his community and has served in many leadership capacities. He is a Deacon at Calvary Baptist Church, where he has served as a Sunday School teacher and a member of the Sanctuary Choir. He was on Emmaus Walk No. 68 and has assisted with several Emmaus Walks and Chrysalis Flights. He is a member of the National Association of Secretaries of State and the Republican Association of Secretaries of State. He is the Co-Chair of the NASS Voter Participation Committee and serves as the NASS Representative to the Steering Committee of the National Voter Registration Day. He is also a member of the United States Election Assistance Commission Standards Board. He is or has been a member of numerous community organizations, including the Alabama Sports Hall of Fame Selection Committee, Children First Board of Directors, Friends of the Alabama Archives Board of Directors, Alabama YMCA Youth in Government Board of Directors, State Republican Executive Committee, National Rifle Association, Leadership Tuscaloosa, Chamber of Commerce of West Alabama, United Way of West Alabama, YMCA, Boys and Girls Club, Big Brothers / Big Sisters, Boy Scouts of America, March of Dimes, Hillcrest High School Athletic Boosters Club, West Alabama Literacy Council and the Alabama Constables Association. He has also served as Southeastern Regional Vice President for the National School Public Relations Association and has served as President or Chairman of many other groups, including the Alabama Children’s Trust Fund, Alabama School Communicators Association, Alabama Community Education Association, American Red Cross, Leadership Tuscaloosa Alumni Association, United Cerebral Palsy of West Alabama, Youth for Christ, Druid Civitan Club and the Tuscaloosa City School’s Vocational Advisory Council. He is a past Chairman of the Tuscaloosa County Republican Executive Committee. John has traveled internationally and represented our state and nation in Canada, China, Germany, Russia and Taiwan. John has been married to the former Cindy Benford of Phil Campbell for 33 years. She is a career educator and the former principal at Westwood Elementary School in Coker. The couple has two children, Brooks, 28, who lives in New York and works with the Chick-fil-A corporation, and Allie Grace, 25, who is an International Flight Attendant with American Airlines.